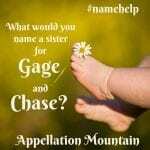 Name Help is a series at Appellation Mountain. Every week, one reader’s name questions will be discussed. 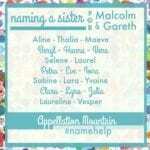 We’re relying on thoughtful comments from the community to help expectant parents narrow down their name decisions. Thank you in advance for sharing your insight! I am having so much trouble naming our new baby boy that’s due any day and would love some advice. My husband and I have two girls named Emerson Grace and Aniston Kate. We like different but not weird or “unique” names. Surnames tend to be our style as well. Our shortlist keeps changing and this baby should be here any day! His middle name will be Michael (family name). I like Ford Michael best because of the family link, but is the association to Ford Motor going to be an issue for him growing up? Are we missing another name that would be a better fit? Any help or advice would be great! Please read on for my response, and leave your thoughtful suggestions in the comments. 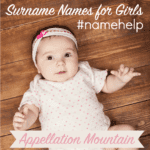 Almost every #namehelp post ends with my list of suggestions for additional names to consider. But not this one! I think your shortlist is perfect as-is. Let’s go through the four names that have emerged as finalists, but not necessarily in the order you’ve listed them. If I had to drop one immediately, it would be Britton. Here’s why: Emerson and Aniston are broadly familiar as given names. Emerson is fairly common; Aniston, not so much. But thanks to Jennifer Aniston, we all recognize the name immediately. Britton seems like more of an outlier. 104 boys and 61 girls were given the name in 2016. It seems to be gaining in use for girls and falling for boys as a long-term trend. This makes me wonder. Would it be forever misheard as Brendan and Brandon and Brennan? Or would it be perceived as a spin-off of Brittany? If it were your all-time favorite name, I’d encourage you to use it, knowing that it might take some repetition to get it right. But since it’s a recent addition to your list? I think I’d move on. The bestselling novel and the blockbuster movie it inspired weren’t enough to boost the name in the ratings; instead, it caught on in the 1950s and 60s, the age of rugged names like Clint, Bart, and Trent. And yet it didn’t really take off then, either – Rhett is at its most popular today. I think it works nicely, and fits the different-but-not-too-different mark nicely. Something I can’t help but notice: Emerson, Aniston, and Sullivan all have three syllables, without sounding too similar at all! I tend to find that kind of symmetry appealing, but it’s certainly not necessary. Sullivan is probably less familiar as a given name than Rhett, but that’s changing. It re-entered the US Top 1000 in 2002 after many years’ absence, and has climbed steadily, reaching #409 by 2016. One point to consider: Sullivan might shorten to Van, but I suspect lots of people end up calling Sullivan Sully. It’s friendly and approachable, and kind of a fun name. But if you’re not wild about Sully, it might be better to keep looking. Ford ties in to your family history, which is a real bonus, but there’s much more to love about this short, simple name. It combines a certain Americana spirit, thanks to the Ford Motor Company, with a rugged, outdoorsy vibe. (Think of fording a river.) Combined, it’s so much more than a car, isn’t it? It sits just outside of the current US Top 700, so you might argue it’s too rare. But who hasn’t heard of Ford? Names chosen for rock-solid reasons, like a family name, tend to wear well. Even if Ford catches on and becomes the next Mason, no one can take away the ties between the name and your loved ones. It seems like a real bonus that Ford Michael connects across multiple generations, while feeling effortlessly at home in 2018. I’d put Ford Michael and Sullivan Michael at the very top of the list, and I’d probably rank them in that order, too. But let’s open it up to the readers. 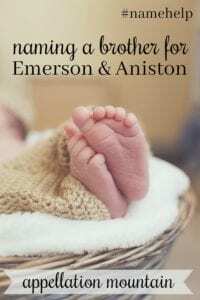 Which of these names seems best as a brother for Emerson and Aniston? Sullivan seems to fit your style, but you may feel limited in choices if you have more children. Also, given a list of Emerson, Aniston, and Sullivan, I wouldn’t know who’s a girl and who’s a boy. If you like the unisex nature of the names, then go for it. But like everyone else, I think Ford is a solid choice. It would also separate the boy from the girls, if that appeals to you. I’ll offer Bretton – part Rhett, part Britton. The most famous namesake is Bretton Woods, the historic resort in New Hampshire. Sullivan! Emmie, Annie and Sully! I think they sound lovely together. I think if you are ok with a possible nickname and also want to continue the 3 syllable pattern then Sullivan is a great choice. I like that all 3 of your children would have 3 syllables while all sounding different. If having a family name is important to you and you think you could tolerate the Ford Motor references every once in a while then go with Ford. I personally like Sullivan a tad bit more. I also want to suggest Grant and Hayes. Hayes would be my number one pick overall. Ford Michael gets my vote for top choice!! It’s family ties make it even more appealing. I think it’s solid for a 2018 baby and great for your family. My friend has a Ford and a daughter (Charlotte). When I heard his name I thought it was so cute and handsome, and the car association didn’t take away any appeal for me. Forgot to say that all the little Britton I know are girls. I think it would be a great option if you ever have another girl! Totally agree…Ford Michael or Sullivan Michael are excellent choices! I love the idea of a little Sully but would be hard pressed not to go with Ford due to the family connections. I thought Sullivan without reading your shortlist so I think it fits very well. I also know a 7yo Sullivan, who does get called Sully if that helps. Having said that I’d find it hard to resist a good family name! I think Ford is a wonderful option for you. It provides distinct but compatible styles for your boy and girl names. A question for you: in hindsight what do you think about naming Aniston with its association to the famous Jennifer? If your reaction is “whatever, Aniston is an awesome name, I’m unphased when people mention Jennifer” then go with Ford. If your reaction is “the Jennifer thing annoys me to no end, and while I certainly love my daughter and can’t imagine calling her something else, I wish we’d given this association issue more consideration” then go with Sullivan. Sullivan Michael is perfect IMO! I’m not a fan of Ford as a first name, but I really love the flow of Sullivan Michael. It sounds solid. Another nice combination is Jameson Michael. It offers a couple of nice nickname options. Ford Michael sounds like The Name to me! I don’t think the association with Ford Motors is a bad thing at all. You are definitely not setting him up to be teased. Others in that vein would be Jefferson or Harrison, but they may sound a bit too much like your daughter’s names.